The 2007 Tampa Bay Devil Rays were an unfathomably ugly team to watch. They ranked dead last in baseball with a 5.53 ERA. Their bullpen also fared worse than anyone else, putting up a stupendously bad 6.16 ERA. The pitching staff was manned with plenty of arsonists, to be sure. But what made this team truly terrible, and truly horrifying to watch, was its defense. When you get to hell, the first thing you’ll see will be highlights of a young Delmon Young flailing after fly balls. you would never believe this was the same team from a year earlier. Because it wasn’t. Baseball Prospectus tracks a defensive stat called Defensive Efficiency, a Bill James creation that measures the frequency with which teams turn balls hit in play into outs. Using that stat, the ’08 Rays saw the biggest year-over-year improvement of any team in 50 years. The story of the Rays’ improbable rise from worst to first — and their subsequent run of three playoff berths in four years playing with limited resources in the toughest division in baseball — is the story of a team that learned many lessons, none larger or more important than the value of defense. Which is why watching the 2012 Rays is so puzzling, and painful. They rank middle of the pack or worse in multiple advanced fielding metrics that measure a team’s range and out-making ability. And they make costly mistakes at an alarming rate: Only the Orioles, who carry all-world butchers like Mark Reynolds and Wilson Betemit, have committed more errors than the suddenly butterfingered Rays. 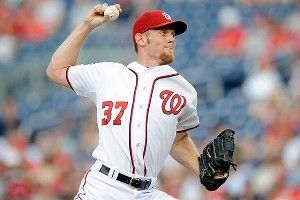 The Nationals parlayed several advantages into their 3-2 win over Tampa Bay Wednesday night. The biggest edge, as you’d expect, was Stephen Strasburg. Nationals general manager Mike Rizzo set an innings cap of 160 for Strasburg this year; with the all-world right-hander destroying the league and on pace to hit that threshold by Labor Day, you wonder how long Rizzo will stick to that promise. Strasburg went seven innings Wednesday, ceding two runs on five hits, walking two and striking out 10. Most pitchers would kill for outings like those; for Strasburg, it wasn’t anything special, might’ve even been a little disappointing. After walking just three batters in his previous three starts combined, he walked two in the first three innings Wednesday. He wasn’t as pitch-efficient as he often can be, either, needing seven pitches before retiring Desmond Jennings on a hard lineout, then running a 3-1 count to Hideki Matsui before allowing an eventually seeing-eye single; all told, he needed 33 pitches to get through the third. Fine, these are tiny complaints for any non-Strasburg pitcher. But giving up a home run to Jose Molina? An absolute bomb over the bullpen and into the seats in deep left-center? That ain’t right. Washington’s bullpen then did what it has been doing with ruthless efficiency for the past several weeks: completely shutting the opposition down. After some dicey times with Brad Lidge and Henry Rodriguez pitching the late innings, the back of the Nats bullpen now ranks among the very best in the game, even if it’s also one of the most anonymous. Tyler Clippard has emerged as a lights-out closer, striking out 11 batters per nine innings. Lefty setup man Sean Burnett owns a 4-to-1 strikeout-to-walk rate, an impressive 51.7 percent ground ball rate, and a tiny 1.13 ERA. Righty setup man Craig Stammen has been equally unhittable. On this night, Burnett allowed a leadoff single in the eighth (which was quickly erased by a double play), and that was it for Rays base runners in the game’s final two innings. But the biggest difference came in how the two played defense. After Strasburg’s stressful third inning, he risked getting himself in trouble to start the fourth, as the speedy Elliot Johnson hit a slow roller up the third-base line. But Ryan Zimmerman, one of the best defenders in the game at any position, charged in, fielded the ball cleanly, made a smooth transfer to his throwing hand, and gunned down Johnson in one fluid motion. Johnson later leveraged his speed into a hustle double, giving Molina a chance to tie the game in the sixth. But Steve Lombardozzi, a utility infielder pressed into everyday outfield duty with the Nats fighting injuries, raced in and made a diving catch on a sinking liner, preserving Washington’s slim lead. The Nats rank first in the majors in Defensive Efficiency (though only slightly better than the Rays in other metrics such as Ultimate Zone Rating). Their defensive superiority showed in this game. In fact, the Rays essentially lost the game in the first inning, thanks almost entirely to defensive blunders and an overall lack of playmaking. Chris Archer did dig his own hole to start. The 23-year-old righty, part of the booty from the Matt Garza trade with the Cubs, was making his major league debut. At first, it showed. Facing the banjo-hitting Lombardozzi, Archer fell behind 3-0, later yielding a double to right-center on a 3-1 fastball that caught too much plate. He threw two straight balls to start against Bryce Harper, too, then gave up a sharp single to center while still behind in the count. It would have taken a near-perfect throw to get Lombardozzi, and with the heart of the Nats batting order coming up, the percentage play was a throw to second to prevent Harper from waltzing into scoring position. Nope. B.J. Upton, a talented player who sometimes lets his aggressiveness get the best of him, fired home hoping to nail the runner. The peg was actually right there, but Molina couldn’t handle the resulting short-hop, and Harper got his extra base. That was nothing. Zimmerman, the All-Star third baseman who signed a $100 million contract only to see his 2012 season crushed by a serious shoulder injury that knocked him out for weeks and currently has him hitting like a pitcher, tapped a grounder to short for what figured to be a sure out. Harper ran on contact, making him a dead duck at third. Johnson delivered a chest-high throw to third baseman Sean Rodriguez, one that arrived with Harper still 15 feet from the bag. And Rodriguez completely biffed it. The ball ticked off Rodriguez’s glove and went rolling by, allowing Zimmerman to stroll into second. When Rodriguez opted not to run after the ball, it trickled into Washington’s dugout, giving Harper an automatic extra base and the Nationals their second run of the game. After Archer settled down and got two outs while keeping the Nats off the board, Ian Desmond came up. Desmond rapped a grounder wide of third that looked like it might be playable. But Rodriguez reacted a split-second late, got a late break on the ball, slightly short-armed his dive for it, then watched it bound into left for an RBI single. Rodriguez’s lapse on Johnson’s throw and his non-play on Desmond’s hit gave the Nats their eventual margin of victory. It also reminded us that while Rodriguez is typically an above-average defender, he’s certainly no Evan Longoria. The good news for the Rays is that they still own the sixth-best record in baseball, even with Longoria out since the end of April, with injuries felling multiple other key contributors for extended periods of time (including Jennings, whose absence further hurt the Rays’ defense). They’ve done it with a very good starting rotation, a revamped and very effective bullpen, enough hitting to be competitive, and a little bit of luck. Even injuries to starters Jeff Niemann and Jeremy Hellickson haven’t slowed them down, with the Rays deploying their incredible organizational pitching depth to get Alex Cobb and Archer into the rotation. (Archer’s start also broke a streak of 232 straight games in which a pitcher drafted by the Rays started one of their games; per Elias Sports Bureau, that was the longest such streak since the Orioles’ 270-game streak from September 15, 1981 to July 20, 1983.) After that rocky first inning, Archer settled down and fired a gem. He held the Nats hitless and scoreless over his last 5 1/3 innings of work, needing no more than 13 pitches to retire the side in any inning after the first Archer’s final line: Six innings, three hits, one earned run, one walk, seven strikeouts, one trip to the danger zone. But you wonder how long the Rays can keep contact in the AL East without their best player. Longoria went on a rehab assignment, with a return this weekend considered a strong possibility. Then he suffered a setback, and the Rays are now bracing to see how much longer his barking hamstring will keep him out of the lineup. With the Yankees catching fire and strong wild-card contenders like the Angels picking up the pace, the Rays now find themselves in the thick of a hellaciously competitive (early) playoff race. This is a good team without Longoria. But it’s also a vulnerable team, one that has kicked away more than one game with lousy D. If there’s such a thing as Rays Baseball, the Rays have had too many nights where they haven’t played it. Do that against Stephen Strasburg and you’ll lose every time.